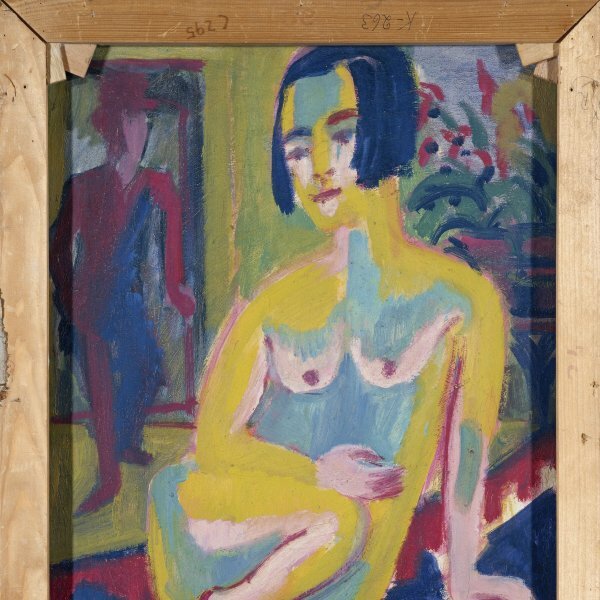 The founder and main promoter of the German Expressionist group Die Brücke (The Bridge), Ernst Kirchner started out as a self-taught artist while still studying architecture at the Technische Hochschule in Dresden, where he was awarded the 1905 diploma. In 1904 he moved temporarily to Munich, where he worked in the studio of Wilhelm Debschitz and Hermann Obrist and became acquainted with the woodcut technique through Dürer’s work. 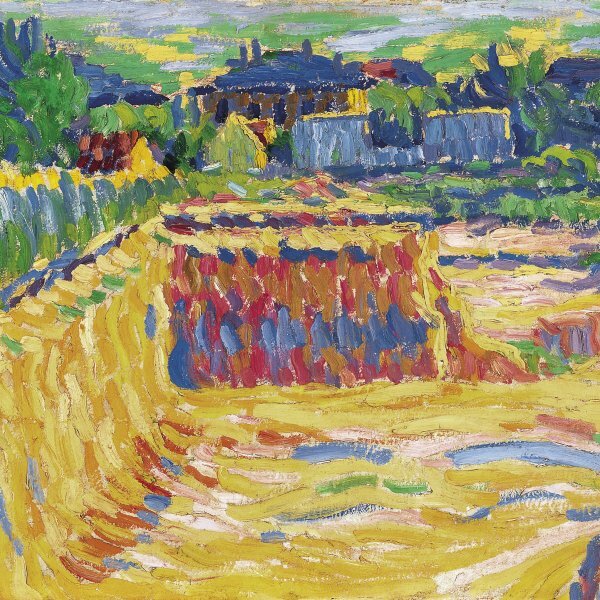 Back in Dresden, in June 1905 he was involved — together with Fritz Bleyl, Erich Heckel and Karl Schmidt-Rottluff — in creating the revolutionaryminded and intensely active Brücke group. His interest in primitive art, which he viewed at Dresden’s Ethnographic Museum, was reflected in both his paintings and the furniture and murals he produced for the studio he shared with Heckel in a former butcher’s shop in the working class district of Friedrichstadt. 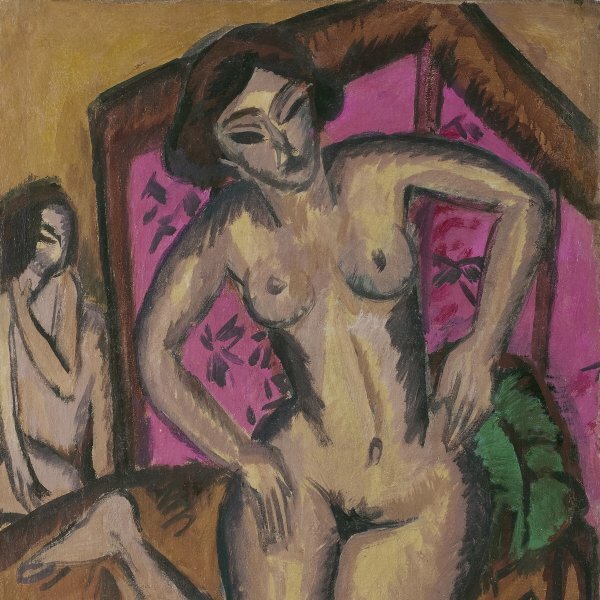 In October 1911 Kirchner moved to Berlin, where he painted his most significant works and began to enjoy a certain amount of success that led him to be selected for the Armory Show, an exhibition of contemporary European art held in New York in 1913. As a result of his contacts with the components of the Munich Expressionist group, the members of Die Brücke were included in the exhibition of Der Blaue Reiter (The Blue Rider) in 1912. Kirchner’s conscription in the First World War led to a serious deterioration in his physical and mental health, and he was finally declared unfit for service in 1915 and moved to Davos, where he lived in isolation for the rest of his life. In the Swiss mountains he began to paint again and write art reviews under the pseudonym Louis de Marsalle. The advent to power of the Nazis in Germany and the confiscation and destruction of his works caused a relapse in his depression and he committed suicide in June 1938. Throughout his career Kirchner’s oeuvre retained an Expressionist simplification of form and an arbitrary use of colour. As with the rest of the Die Brücke painters, the early influence of Van Gogh gave way to a more synthetic and two-dimensional style characterised by thick brushstrokes and greater autonomy of colour. He started off painting landscapes, with or without figures, and nudes, and later concentrated on the bustle of the Berlin streets, of which he painted memorable scenes from 1912 to 1914. In Switzerland he resumed landscape painting, producing scenes infused with growing mysticism.